Atheist Geek News » Ex-Jehovah's Witnesses » Is That An Attack On The Watchtower Society Or Are You Just Criticizing My Religion? Is That An Attack On The Watchtower Society Or Are You Just Criticizing My Religion? and we don’t even know it. Ever since I posted my series about the November AWAKE! articles on atheism, I’ve started seeing more comments from Jehovah’s Witnesses here on Atheist Geek News. Some Witnesses say they only stopped here because they saw my “attack” on the magazine and wanted to defend it (or defend the Watchtower Society by implication as the magazine’s publisher). I take exception to this and wanted to explain my position for future commentators. Here’s the thing. I don’t think there’s anything wrong with someone posting a rebuttal or offering a criticism to something I’ve written. Especially if what I’ve written is factually incorrect. I just don’t think words like “attack” are warranted here. Unless every criticism against everything is also an attack, that is. At which point, both words become synonymous and it doesn’t matter which one you use. My criticisms of the Society are less about highlighting the organization’s flaws and more about giving fellow exxers1 a chance to defend themselves against Witnesses who want to bully or harass them. (Please don’t say that this doesn’t happen. As anyone who frequents this or other exxer sites should know, it actually happens a lot.) 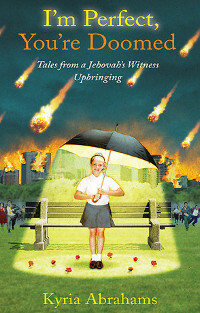 Thanks to the Society’s literature, Jehovah’s Witnesses have a veritable library of arguments they can use when they go after ex-Witnesses for our life choices. So I see nothing wrong with pointing out the problems with those arguments, or even discussing other flaws in the Society’s thinking, to even the odds. 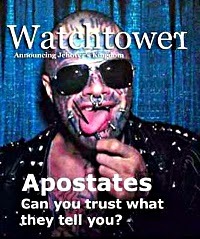 In fact, I’d even say that my criticisms aren’t so harsh as the Watchtower Society’s. The organization has been writing about the problems they see with entire governments, other religions, and people of all stripes worldwide for more than a century. They see apostates (or people the organization chooses to label as apostates) as “mentally diseased” and, at times, even suggested that they’re under demonic control. I’m not exaggerating or making this up–it’s appeared in the literature at different times throughout the Society’s history. If Jehovah’s Witnesses can see criticisms like these as reasonable, then I suggest they’re judging my comments by a wildly different set of standards than the organization’s. And maybe–just maybe–Witnesses who think I’m attacking their beliefs or their literature are being a touch too sensitive about it. At least I haven’t accused the Society of being a false religion in the usual sense2, a cult3, mentally diseased, or under demonic control. If I have, please let me know. The worst things I’ve said about the Society or its Witnesses were usually said in jest. Yes, I do have a diabolical sense of humor. It’s part of my awesomeness, and not for everyone. For regular visitors, it’s one of the things that keeps them coming back. It also makes most of my articles less boring than most other ex-Witness or atheist sites. If you have another opinion about all this, please add it to the comments below and we’ll talk about it. Please quote examples and give links where appropriate so I know what you’re talking about. In the meantime, I hope I’ve offered some perspective on the whole “attacking” thing. Tagged attack, criticism, Ex-Witnesses, Jehovah's Witnesses, religion. Bookmark the permalink. 13 Responses to Is That An Attack On The Watchtower Society Or Are You Just Criticizing My Religion? Thanks for the feedback man. That’s what I try for at least. Um…I just noticed something. I read your about page and I just re-did mine for my site, and…well, I just realized I worded some things a lot like yours and…so, should I change some stuff around so it doesn’t look like I totally copied from you? I mean, yeah…How embarrassing. I have to admit it still amuses me when witnesses post on forums that are openly against the Organization’s teachings. I know it happens often, but, no matter their reasoning, they are still going against the Society’s teachings when engaging in a conversation with an “apostate.” I don’t mean to be down on people who are honestly searching for information (especially if their goal is to leave the Watchtower Organization), but really why are they even on websites like this, if there is a potential danger to their faith, as the Organization claims? GOI, some of them are actually very amusing. The ones who curse and rage at me are probably teenagers having a knee jerk reaction. If I had a true forum, per se, others could pounce on their comments. But with JWD and JWR, I guess I didn’t think that many people would bother with my forum over those. So it’s up to me to respond or to imply they are right with my silence. Well, that’s no fun. The better comments, or even the calm but sincere ones, deserve some kind of response. I often find that such a response takes as long as any article to write! It would be better if I had something ready in advance that I could point them to. After all, many of them have the same complaints. Thus, you get occasional posts like this. I will try to pepper a few more into the mix over time. I do not think it is isolated to one religion. While the Witness folk have a slanted view of life, gearing their articles and opinions toward their organizational view point and beliefs, I have actually found they actually check their facts more thoroughly than other main stream christian organizations. On the flip side, they do have a select audience they pander to with their articles, and do not cite themselves to be a premier new organization. While I disagree with their points, I am ashamed of them, as human beings for taking the stance to attack people who may disagree with their views or articles. This not only contradicts their message of tolerance and acceptance, but it also defeats the purpose of their organizational goals and beliefs. It would be far different if your article had been some sort of blasphemous armada of slander littered with grammatical vomit, offensive language and gross lies, but it was not. My biggest issue with people who respond to something that offends them is their inability to take a deep breath, analyze what they are planning to refute, and actually do so as the intelligent, thoughtful person they are trying to be. It always falls to accusation, insults and inaccurate representation of what happened or facts. I agree, all religions have people who react to general criticism with strong emotions. Actually, I would expand that to all groups of people. Every club has its heroes and its jerks, and there are plenty of positions to occupy in between. Epic, I don’t know about your current religious beliefs, but for me as an atheist, I’ve come to appreciate the dilemma presented to famous atheists like Dawkins and Hitchens. You can only use so much mollifying language before an article becomes unreadable. I’ve been working on some other projects along those lines, and I see the problem. But what’s a critic to do? You just have to pick your line in the sane and hope the right people listen to what you have to say. Most groups are like that, but they do not bring it to the media, harass people in their homes, cast the first stone, etc.. It’s usually gossip that is later forgotten for new gossip. It is how criticism is delivered. I have learned through vast, militant training in management to list off really good things, at least two, in a positive light, and then follow it with a fluffed version of the criticism. I don’t really believe in anything. I joke about worshiping my awesome toaster that was manufactured the day Kennedy was shot. I used to believe in people, but even they are drifting from kindness to nihilism. I assure you I am not a whack-a-doo, but with age comes experience. With experience comes growing loathing for certain situations that seem to circle out into the world. I am not ready to blame the poor for being poor, seniors for growing old, and children for their inability to defend themselves. I am also not willing to believe the entire constitution is gold except for the religious freedoms. It is a crazy world when we put more efforts into declaring a nationalize religion than we do taking care of our children, ourselves and each other. I have observed that most people tend to think that things were better “back in the day.” Especially when they were young. Then they get older and they tend to think that everyone is disrespectful, out for themselves, and the world is going to crap. Yes, these trends do happen, but I suggest that this is an internal change of perception more than an outwardly one. I’m sure you realize that the elderly complained about the young thousands of years ago. The elderly did so back when movies were black and white, too. You know, back when my grandparents were my age. In other words, our grandparents grandparents complained about them (or their generation) too. If things truly are going continuously downhill, for thousands of years, we would have destroyed ourselves long ago. The older we get, the more aware we are of the bad stuff. This colors our point of view. We tend to think the world is getting worse, even during times when it’s getting better. This is a trait that groups like the WTS can use against us, BTW. How many times have they asked, “Don’t you agree that the world is getting worse?” Then they segue into their spiel. I remember the 80s as a time of innocence, yet there was the constant threat of nuclear war and terrorism. I was just a kid, though. I see the 80s through a child’s eyes, and the twenty-first century through the eyes of 38 year old. Everyone does this. I’m not saying that your wrong, exactly. Only that these trends go up and down with the times, even though it may seem they are going one direction only. The one constant–the barometer that keeps moving down, down, down–is ourselves and how we see the world. I hope you can take some comfort in that. I try to. I’d like to call myself a secular humanist, but only reluctantly. Only to the extent that humans are the only game in town, and hence, the only hope we have. No gods will be swooping in the save us. No angels will show up on our doorsteps bearing gifts. It’s all us, sink or swim. I’m an ex-JW & an athiest also. I’m glad I found your site! It’s quite funny & oh so true. Between working at a cancer clinic & (what I call) being brainwashed & pretty damn much forced to be a JW when I was about 12 yrs old…I couldn’t help but NOT to believe in any kind of god or religion. I (like you) will NEVER step foot in a Kingdom Hall or for.that matter any other church ever again. As an ex-JW I know everything i’ve read on here is true. You have a light & interesting way of putting things that makes it fun to read. I will be back!